From works like Nishimura Hakuu´s (西村白烏) Enka Kidan (煙霞綺談) or Yuasa Jōzan´s (湯浅常山, 1708-1781) Jōzan Kidan (常山紀談) we know, that the Takemata-Kanemitsu was also temporarily called Azuki-Kanemitsu (小豆兼光) because of the incident with the red Azuki beans. And apart from that, these publications tell us that there were two more swords in the possession of the Uesugi whose name goes back to beans, namely the Azuki-Nagamitsu (小豆長光) and the Aka-azukikayu-Yukimitsu (赤小豆粥行光, “Azuki-bean gruel Yukimitsu”). The former work mentions that Kenshin fought a duel with the Azukikayu-Yukimitsu measuring 3 shaku 1 sun (~ 93.9 cm) at one of the Kawanakajima Battles with Takeda Shingen, but this clash can´t be confirmed by other historical documents. There is the following interesting anecdote about the name „Azuki“ in connection with swords. It is said that the legend about a bean-cutting sword bothered the bakufu official Kubota Sugane (窪田清音, 1791-1866) for a long time. So he visited his protégé and favourite swordsmith Kiyomaro (清麿, 1813-1854) to get to the bottom of the matter. After several tests they found out that even the sharpest and most freshly polished blade was not able to cut through an Azuki bean dropped on it soley by its force of gravity. The bean was too hard and bounced back instead of being cut into two. So both paid master Taikei Naotane (大慶直胤, 1778-1857) a visit and he enlightened them: “The bean matter is an old fairy tale. The name azuki goes back namely to the similar sounding word nazuki which means ‘head.’ This means that swords with such a name had sometime split a skull!” From an etymological point of view Naotane was right because nazuki (脳髄) actually means “skull,” “head” or “brain,” but others assume a more harmless background, namely that the name azuki goes back to certain characteristics of the blade´s hamon which probably reminded people of little beans. But let us return to the so-called Azuki-Kanemitsu. Fukuda Kenryū (福田顕龍) writes in his 1862 publication Tōken Shōzan (刀剣正纂) that the name Azuki goes back to the incident with Mochizuki Heidayū. Fukuda explains that the characters of the family name Mochizuki (輪形月) can also be read Wazuki which became in the course of time – or by wrong and/or repeated transcriptions – Azuki. “In fall of the third year of Genki (元亀, 1572), Uesugi Kenshin expresses his gratitude for the receipt of the Osafune Nagamitsu sword and an armour in yamabushi style which was granted to him by Tōshōgu (東照宮, the author uses the posthumous name of Ieyasu) to strengthen the friendly relations of their families.” So the Uemura piece came from the Uesugi family but does not correspond to the length of 3 shaku 5 sun 8 bu (~ 108.5 cm) quoted by Kōetsu. As the blade shown in picture below is unshortened and has its original ubu-nakago with the signature of Nagamitsu we can safely assume that there were at least three swords going round which had the nickname Azuki-Nagamitsu. According to a tradition, the Azuki-Kanemitsu had another nickname, namely Namioyogi-Kanemitsu (浪およぎ兼光, “wave-swimmer Kanemitsu”). The accompanying legend says that there was a sword duel at Ise´s Kuwana (桑名) after which the loser tried to escape via the nearby river. He was able to swim five or six metres before his body fell into two halves! The chronicle Kawasumi Taikō Ki (川角太閤記) says that the sword went later to Tokugawa Ieyasu who presented it to his son Matsudaira Tadateru. When the latter was exiled (see this story) it was handed-over to Doi Toshikatsu (土井利勝, 1573-1644) who was then one of the top-ranking bakufu officials. An unverifiable tradition says that Sasabe Shigemasa (雀部重政, 1559-1595) took with this blade the head of Toyotomi Hidetsugu (豊臣秀次, 1568-1595) when he was his kaishaku at the seppuku ceremony. In the end it was eventually owned by Tachibana Muneshige (立花宗茂, 1567-1643) and became a heirloom of the Tachibana family. Picture below shows the Namioyogi-Kanemitsu from their records. It bears a kinzōgan-mei which refers to a different context, namely to when it was allegedly worn by Kobayakawa Hideaki (小早川秀秋, 1577-1602), who bore at a time the name “Hashiba Hideaki” (羽柴秀詮), the time when he was Chūnagon of Okayama. The gold inlayed inscription reads: “Hashiba Okayama Chūnagon Hideaki no shoji – Namioyogi matsudai no ken Kanemitsu ya” (羽柴岡山中納言秀詮所持之・ 波およぎ末代剣兼光や, “the Namioyogi-Kanemitsu for the future generations [of our family], worn by Hashiba Okayama Chūnagon Hideaki”). By the way, it is also speculated that the nickname “wave-swimmer” goes back to the carving of the dragon which really looks like a dragon swimming atop of waves. Let us summarize: A bean-splitting ōdachi by Kanemitsu was in the possession of the samurai Takemata, then Uesugi Kenshin who killed Mochizuki Heidayū with it and split his teppō. Also in the possession of Kenshin was the Teppōkiri-Kanemitsu with which he cut through an unknown man and his matchlock during a rainy typhoon night. 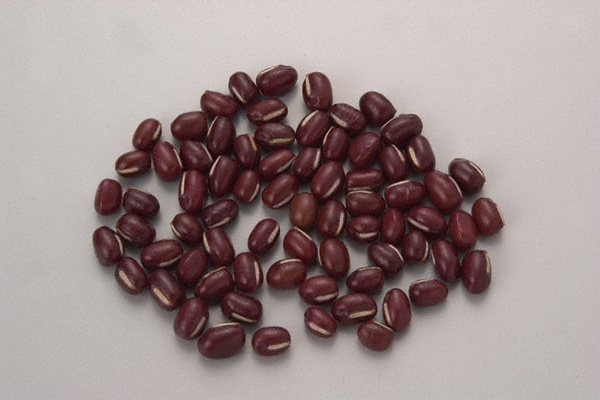 And then there was the Azuki-Kanemitsu which was maybe a temporary nickname of the Takemata-Kanemitsu based on the story of the split beans. Or the latter was a mix-up with the Azuki-Nagamitsu because there exists several blades with that name and the nickname Azuki-Kanemitsu never existed. Anyway, the Hon´ami Kōetsu Oshigata depicts three different blades: The Azuki-Nagamitsu, the Takemata-Kanemitsu and the Namioyogi-Kanemitsu. So in short, it is rather likely that the nickname Azuki-Kanemitsu was never in use.